Barry Oats (left) with Phil Davies. 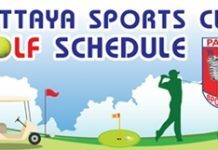 The Pattaya Links Golf Society began July with its second largest field of the year when they visited the sumptuous Laem Chabang to play a stableford competition in three flights, divided at fourteen and under and 21 and over. The course, more especially the B and C nines, at the moment is in wonderful condition and a hot day, refreshed by a constant cooling breeze helped the golfers to enjoy the experience. In the top flight, three-handicapper Jay Burns collected 34 points from his best gross round (77) to take third place on countback from Phil Davies, with Kevin McEntee also benefitting from c/back to take second place. The flight winner was Tommy Marshall who took the victory with 36 points. In the second flight Toby Glass came good at last with a sparkling 35 points for third place, a couple behind a resurgent Colin Service on 37 points. The flight winner was Andre van Dyk with an excellent 39 points matching the best points total of the day. The third flight saw Mike Firkin’s newly re-shafted driver do the business (most of the time) as he made his way to a third place of 34 points. In second was Terry Mangan with 37 points and the flight winner was Barry Oats with 39 points. Near pins were won by Nigel Harrison (B5), Brock Jensen (B8), Barry Oats (C5) and John Pierrel (C8). Consolation awards went to Phil Davies for his best front nine of 22 points and Ken Hole for his best back nine of 19 points. Today we played another quality golf course in Pattana and have previously used so many words to describe how good this course is, I am scratching for some new way to say how beautiful are the freshly cut fairways, or the speed and true run of the greens. 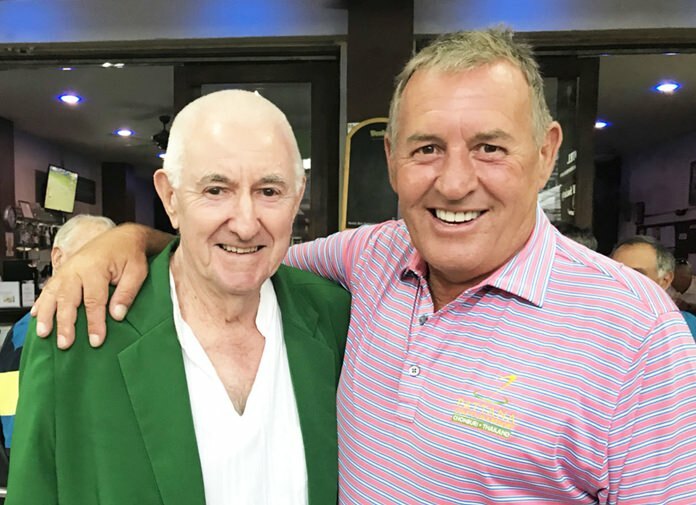 Three weeks ago we played at Pattana and Phil Davies wore the green jacket after scoring 40 points. Today he once again took all before him, this time with magnificent 42 points. Yes, in case you ask, his projected handicap has lowered. There was a logjam for second place with a four -way tie on 38 points. Winning second spot was Wayne Peppernell from Terry Mangan in third and Derek Phillips taking fourth. The unfortunate one to miss was “hot and cold” Tip Briney. However, Tip had a small consolation by winning Best Front Nine with 21 points. Maurice Roberts scored the Best Back Nine with 19 points. Thirty one golfers made the short trip to Khao Kheow Country Club which was not in its best condition but still provided a tough test. No player was able to play to handicap, but A Flight (0-17) winner Anand came close by scoring 35 points, and B Flight (18+) winner, Mike Tottenham matched that points score. In A Flight, Phil Davies continued his run of form, as he took second place with 34 points, while Maurice Roberts nudged out Mitchell Carlon in a countback, to grab third, both on 33 points. The B Flight saw similar scores as John Anderson, in a rare display of good form, made second place his with 34 points. Two players on 33 points had to be separated by countback, and it was Jim Galendaz taking it over Dave Arataki. Near pins went to Maurice Roberts (B3), Toby Glass (B8), Derek Phillips (C3), and Phil Davies (C8). Best consolation nines came from Tip Briney (front, 18pts) and Wayne Peppernell (back, 19pts).